Lakshmi Puja is a Hindu religious festival that falls on the Purnima (full moon day) of Sukla Paksha (Light fortnight) in the Vikram Samvat Hindu calendar month of Ashwin, the third day of Tihar or Diwali. 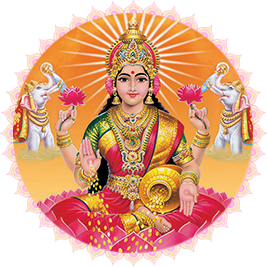 Lakshmi Puja, or the worship of the goddess of wealth, is the main event of Diwali for most Indians and many businessmen to begin a new ledger of profit and loss, for the upcoming New Year by invoking her blessings for peace, wealth and prosperity. Lakshmi Puja consists of a combined Pooja of five deities, including LordGanesha, Goddess Lakshmi in three forms, which areMahalakshmi the goddess of wealth and money, Mahasaraswati the goddess of books and learning, and Mahakali. Kubera, the treasurer of the gods is also worshipped. Lakshmi Puja is performed to appease Goddess Lakshmi and thank her for the blessings received. On the Auspicious day of Deepawali, Lakshmi the goddess of wealth and Vishnu's wife bestows gifts and blessings upon her devotees. To welcome the Goddess, devotees clean their houses, decorate them with finery and lights, and prepare sweet treats and delicacies as offerings. Goddess Lakshmi is worshipped for promotion, success and personal virtues. Puja is performed for prosperity, material abundance, and spiritual knowledge and to remove troubles. Goddess Lakshmi is revered on the day of Diwali with religious rituals and ceremonies especially devoted to her. Devi Lakshmi emerged during the churning of the celestial milky ocean by the Gods and Demons. Lakshmi chose Lord Vishnu as Her Consort and Vishnu carried Lakshmi from the ocean into His abode Vaikunth. Goddess Lakshmi is regarded to be the epitome of beauty endowed with a golden complexion. Seen either sitting or standing on a lotus and holding lotus flower in her hand, she signifies beauty, purity,and fertility.Every time Vishnu descends on earth as an avatar, He is accompanied by an avatar of Lakshmi. She was incarnated asGoddess Sita when Lord Vishnu appeared as Lord Rama andwas incarnated as Rukmini when Lord Vishnu appeared as Lord Krishna. Importantly, when she was incarnated as Goddess Padma, Lord Vishnu appeared in the form of Lord Vamana. On Lakshmi Puja,people buy gold and silver, precious gemstones, new utensils of copper, brass,and bronze as a sign of good luck, prosperity, money and wealth. Wearing new clothes also signifies casting off the old and ushering in the new.People also clean up their houses in a gesture to attract Goddess Lakshmi. Decorating the house with candles and lamps and bursting of firecrackers is gestures which are said to welcome and propitiate the Goddess. Lakshmi Pooja will invoke the divine benevolence of Goddess Lakshmi, the Goddess of wealth. She will bestow her devotees with enormous grace. To fill our lives with abundant happiness, wealth and good fortune. By observing this festival rigorously, the swampy situations of life are curbed. Any blockages in life would have a positive ending. To bring good luck and wealth abundantly. Goddess Laksmi is highly kind and generous towards her devotees. She will shower enormous grace to enhance the life with peace and tranquil.